Thule is proud to introduce their new line of innovative snow chains which are hand-made in Italy. The premium 9mm CG9 self-tensioning chain is ideal with limited space between the wheel and mechanical parts. 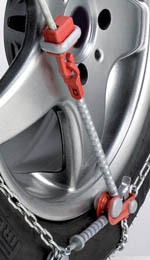 These chains are safe for ABS/ESP systems and alloy wheels. When the winter comes, Thule has the snow chains that get you there safely, easily and in style. Thule, known worldwide as a manufacturer of highly innovative automotive racks and accessories, is proud to offer the newest in their catalogue of winter gear. Thule's award-winning design team has worked extensively with the world's leading automobile manufacturers to re-engineer the standard snow chain. Tested in the Italian Alps, this line of snow chains is surefooted and safe, as well as remarkably easy to install and remove. To make sure you find the right chains for your tires, check the Thule Snow Chain Fitment Guide and find your tire size. 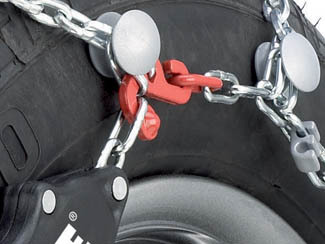 Anti-scratch bumpers lift the chain away from wheels. Thule snow chains are hand-made in Italy and are constructed of durable, hardened manganese nickel alloy steel. They feature dual-sided D-shaped links that provide exceptional traction and extend the life of the product. These snow chains utilize a patented self-centering and auto-tensioning system which adjusts itself for a perfect fit. Once the chains are wrapped around the tire, the installation process is completed when the vehicle is set in motion. As the wheels turn, the self-centering and auto-tensioning system activates and the chain tightens around the tire. This eliminates the need to exit your vehicle and brave the elements to re-adjust snow chains. For easier installation in the dark or during the day, all attachment points on the chains are color coded. Additionally, each set of Thule tire chains comes with a hard case, installation mat, pair of gloves, and spare links. While offering the same patented self-tensioning and micro-regulation solution as other Thule snow chains, the Thule CG-9 is constructed with smaller sized 9mm D-link chain. This makes it the perfect match for sub-compact cars or for vehicles with limited space between the wheel and mechanical parts. Smaller links take up less room, ensuring that they will not bind or damage braking and steering components. They offer perfect compatibility with electronic braking and traction systems as well. These smaller links also enable the CG-9 to give superior driving comfort while still providing excellent traction in snow and ice. Additionally, the special anti-scratch nylon bumpers protect your investment by ensuring that the chains never actually come in contact with your wheels. Thule CG-9 is a perfect combination of design, technology and safety for your winter trips. To choose the right snow chain you must follow a few simple criteria. First, check your vehicle’s maintenance or owner’s manual to verify it contains no warnings advising against the fitting of snow chains on your particular vehicle. 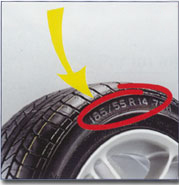 Once verified, take careful note of the three measurements on the side of the tire. The first number indicates the width, the second gives you the aspect ratio (sidewall height as percentage of width) and the third denotes the diameter of the wheel expressed in inches. Then click on the Thule Snow Chain Fitment Guide to choose the most suitable model and size for your vehicle.